Last Updated: June 19, 2018. 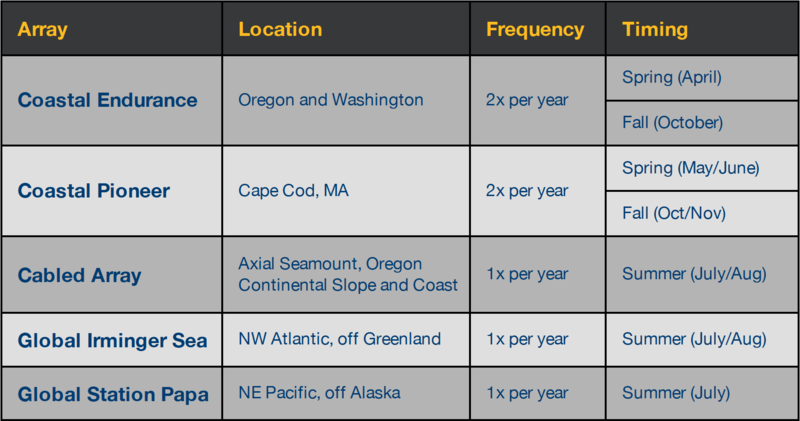 Note that listed future cruise dates are projections and are subject to ship availability. This figure is a simplified graphic representation of the historical and projected future schedule of major infrastructure installation events and maintenance “turn” cruises of OOI infrastructure at each array. For a complete list of all installation and maintenance activities, including using small crafts for glider recover, please visit the Asset Management repository in GitHub. OOI Cyberinfrastructure (CI) systems maintenance is scheduled for Monday, August 27th at 10am EST. Maintenance is estimated to take 2 hours during which time CI production and development services will become unavailable. On Wednesday August 22nd, an automatic protective shutdown of primary power to the OOI Cabled Array occurred during installation of a new chiller system. It is estimated that the array will be back online at 10 am PDT, Friday August 24th. Due to loss of power to the Cabled Array marine infrastructure, data are not currently being collected by the instruments. OOI Cyberinfrastructure (CI) systems maintenance is scheduled for Tuesday, July 17th at 9:00 ET. Maintenance is estimated to take 4 hours during which time CI production and development services may become unavailable. – 2017-07-17 12:59 EDT – Maintenance period extended until 15:00 ET. – Issue Resolved 2017-07-17 16:12 EDT – Maintenance was successful; no issues to report. Beginning Monday, June 18th the OOI will be hosting an Early Career Data Workshop that will involve numerous concurrent data requests by participants. Please be advised that due to this increased load on the system data request fulfillment may be slower than normal. We recommend that, when possible, large data requests be delayed until after the workshop. Please contact the Help Desk with any questions. Beginning Monday, May 21st the OOI will be hosting an Early Career Data Workshop that will involve numerous concurrent data requests by participants. Please be advised that due to this increased load on the system data request fulfillment may be slower than normal. We recommend that, when possible, large data requests be delayed until after the workshop. The OOI uncabled data ERDDAP server is currently offline due to server issues. Investigation is ongoing, and the server should be back up shortly. Due to glider maintenance delays, there are currently very few OOI gliders deployed and delivering live data. The maintenance issues have been largely resolved, and more gliders will be deployed over the late Spring and Summer, building back up to the full complement of gliders in the OOI design baseline. A database error occurred on 08 December that interrupted live data ingestion into the system. Following an investigation, the system was restarted today and data are Cabled data began flowing again. No data were lost, but we will have to ingest the cabled and uncabled datasets to backfill the gap in the available data over the next few days. – 2017-12-12 13:20 EDT – Uncabled data has been started up again. No data were lost. – Issue Resolved 2017-12-13 – Cabled and Uncabled data have been re-ingested and streaming data played back to fill in the gap. We are currently investigating an issue which is preventing plotting and downloading of data on the OOI Data Portal. We hope to have this resolved soon. On Thursday 9 November 2017 starting at approximately 0900 PT (1200 ET), the Cabled Array team will be conducting several required maintenance tasks at the Shore Station in Pacific City, OR that will require the system to be powered down. When the system is powered down, data will not be collected from the deployed infrastructure. The maintenance window is planned for 12 hours, but the Cabled Array team will strive to minimize the system downtime. – Issue Resolved 2017-11-14 – All maintenance tasks were successfully completed without powering down the system, as originally anticipated. As such, no interruption to data collection/streaming in was experienced. Additional maintenance will occur at the Shore Station later this month, however, that will require the system to power down. The OOI website will be updated as details of this next round of maintenance are solidified. On 12 October, 2017, the Surface Buoy on the OOI Global Irminger Sea Array Surface Mooring stopped all communications. There remains no indication as to what may have caused the outage. Full Story. – 2017-10-26 – On 26 October an aerial survey and broad area search was conducted at the Irminger Sea Surface Buoy site and surrounding areas. The surface mooring was not sighted. – Issue Resolved 2018-06-25 – A new surface mooring was deployed during the OOI Irminger Sea “turn” cruise this month. On Monday May 22nd 2017, starting at 10am EST, the OOI Data Portal (OOI Net) will be offline for a scheduled update. We estimate system downtime to be between 1-2 hours. – Issue Resolved 2018-05-22 – The software updates to the OOI Data Portal (OOI Net) scheduled for Monday May 22nd, 2017, have been successfully applied. You can view the list of changes on the OOI Net help page. A series of OOI software updates are scheduled for Monday March 6th 2017, starting at 10am EST. While the update process is ongoing, the Graphical User Interface and the M2M interface will be unavailable. The estimated time of completion is 1pm EST, and a notification will be sent out when all services are back online. – Issue Resolved 2018-03-06 – The series of OOI software updates were successfully completed, and the Graphical User Interface and the M2M interface are now back online and operational. Improvements have been made to the bathymetry and navigation of the map interface, and entries were added to the data catalog for HD Video, Sonar, and seismic data. Full patch notes can be found on the Data Portal’s Help page. Power to the North and South cable lines of the Cabled Array has been interrupted and all deployed infrastructure is currently offline. The Cabled Array team is currently investigating and monitoring the event. System restoration is anticipated on Thursday, February 16, 2017. We are aware of a situation in which data download requests from the OOI Data Portal may take longer than expected. We regret the inconvenience and are working on a solution. The OOI Cyberinfrastructure (CI) online interface will be shut down from Thurs., Jan. 19, 9:00 AM ET to Sun., Jan. 22, 6:00 PM ET while a system upgrade takes place. This shutdown will impact all OOI CI services and tools, including the OOI data portal, Alfresco, Confluence, Redmine, and development environments. 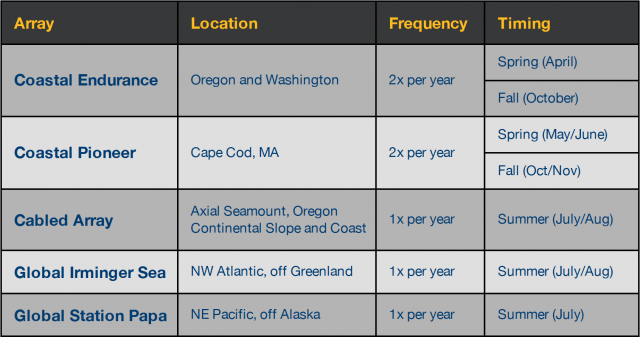 WebEx and oceanobservatories.org will still be available. The OOI operations team is making arrangements to ensure that all data will be collected and backed up during the scheduled maintenance. – Issue Resolved 2018-01-23 – Update has been completed, all systems are back online.